A new study involving biologists from Monash University Australia has found that despite their very different ancestors, dolphins and crocodiles evolved similarly-shaped skulls to feed on similar prey. 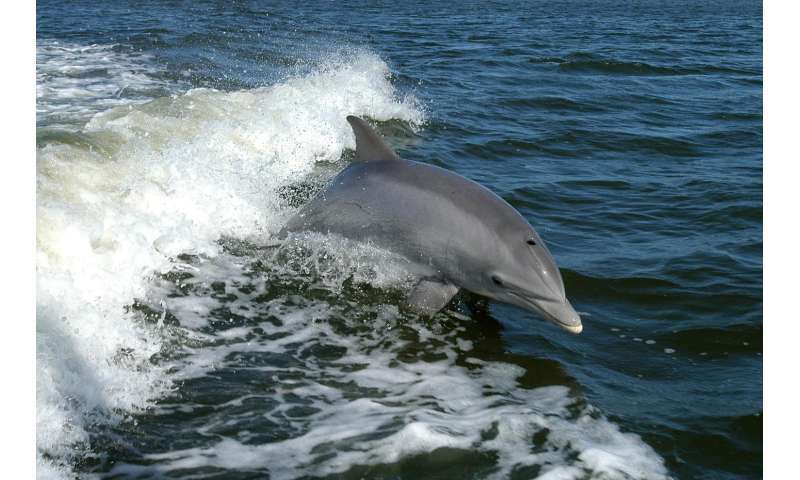 Dolphins and crocodiles now live in rivers and oceans, but each evolved from land-based animals. Feeding in water has many new challenges. This new study shows that despite being separated by 300 million years, dolphins and crocodiles found comparable solutions to these problems, and evolved skull shapes that are remarkably similar. "Our results suggest the remarkable similarity between some crocodilians and toothed whales is driven by what they eat rather than where they live," said lead author Mr Matthew McCurry from the Monash School of Biological Sciences. Previously no rigorous attempt had been made to show how similar the head shapes of dolphins and crocodiles really are. It had been thought that aspects such shallow seas or rivers contributed to the similarity of the skulls of crocodilians (crocodiles and alligators) and toothed whales (dolphins, orca and relatives). But a study published in Proceedings of the Royal Society B: Biological Sciences has debunked this long-held view. Having a long, thin snout must have great advantages when trying to catch small fish, both for crocodilians and toothed whales. "What is really important about this study is that it will help us predict the diet of extinct aquatic mammals and reptiles just from the shape of their skulls," said Mr McCurry. The authors used medical CT and laser 3D scanning to digitally capture the skulls of museum specimens from around the world. Once digitised, the authors could examine the shape of the skulls in detail without having them in one location. Using sophisticated mathematical techniques to analyse 3D shape, the researchers could show how diet, habitat and prey size correlated with skull shape. "Crocodiles and dolphins seem so different to us, but our study shows that many of them are in fact remarkably similar, and this is really down to how they catch their food," said study co-author Associate Professor Alistair Evans, also from the Monash School of Biological Sciences. Future research will aim to uncover why specific skull shapes are better at catching certain prey using bioengineering computer simulations. Lovely fairytale but completely without any substantiating observations, hence completely non-science. Darwinian evolution is simply impossible because there is no way for purely materialistic natural processes to create an abstract entity like information. How does such a process create logic, structural, material and functional specifications? Simply impossible. Is it an exemple of evolutionary plagiarism, or evidence of a common Creator?